Talmudical scholar and head of the yeshibah in Fürth; born Jan. 26, 1770; died May 15, 1850. He was a contemporary of R. Moses Sofer, and is mentioned by the latter in his "Ḥatam Sofer." He wrote: (1) "Sha'ar ha-Zeḳenim," in two parts, the first containing homilies, responsa, and ethics; the second, responsa on civil law (Sulzbach, 1830); (2) "Simlat Binyamin," in three parts: (a) "Simlat Binyamin," responsa on the ritual laws of Oraḥ Ḥayyim and Yoreh De'ah; (b) "Naḥalat Binyamin," responsa on the ritual laws of Eben ha-'Ezer, Ḥoshen Mishpaṭ, and Haggadot, followed by a treatise on circumcision and by some homilies; (c) "Sha'ar Binyamin," halakic novellæ on different sections of the Talmud (Fürth, 1840-41); (3) "Ḳol Bokim," a funeral oration on the death of Meshullam Zalman Cohen (ib. 1820); (4) "Allon Bakut," funeral orations on the death of Herz Scheuer and others (2 vols., ib. 1823); (5) a funeral oration on the death of Maximilian Joseph I., King of Bavaria (ib. 1825). Hamburger was one of the last, if not the last, head of a yeshibah in Germany who, without holding an official position in the congregation, devoted his time to the teaching of the Talmud; his wife carried on a business, and thus supported the household. Hamburger was strictly Orthodox, although opposed to religious ecstasy and mysticism ("Allg. Zeit. des Jud." 1846, pp. 266, 343). With the beginning of the Reform movement, about 1830, when the government aided the advocates of innovations in the Jewish fold, he had to contend with many adversities of which he bitterly complains in his books (see especially preface to "Simlat Binyamin "). His yeshibah was closed, and he was forced to leave the city. 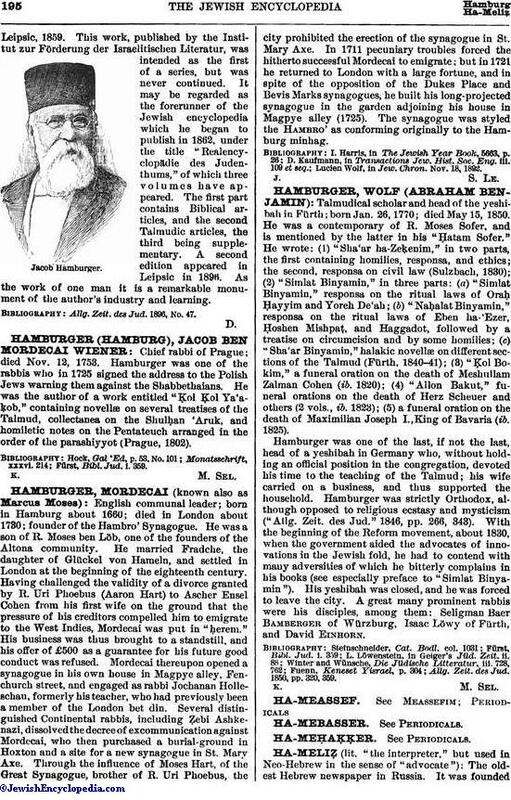 A great many prominent rabbis were his disciples, among them: Seligman Baer Bamberger of Würzburg, Isaac Löwy of Fürth, and David Einhorn. Allg. Zeit. des Jud. 1850, pp. 320, 359.